After I wrote my last tactica on the Wood Elf Enchanted Arrows I decided that I would continue to write tactics posts on various units in the Wood Elf army after I had a few games with the units so that I could understand the units better. This series of posts will have no logical pattern to them; I will talk about a unit after I feel I understand its role. 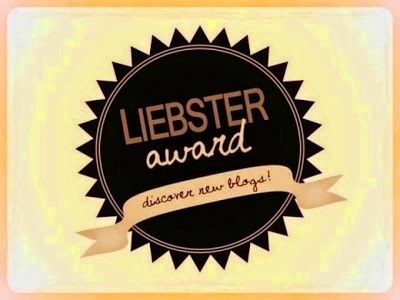 That is why this post will focus on Wild Riders, Sisters of the Thorn, Wardancers and (gasp!) Treekin. Let’s Start with the Treekin. Initially, after the Wood Elf release, a fair few Wood Elf players decried the Treekin believing that the lost strength and reduced ward save made them far worse than they were and dropped them from their lists. I wasn’t among those who acted this way. While I saw the characteristic reductions as a issue I didn’t see it absolutely killing off their use. At the end of the day they are still Strength 4 (hard to come by in the Wood Elf army), Toughness 5, 3 wounds monstrous infantry that cost 20 points less than before and still have a 4+ scaly skin and a 6+ ward save. A unit of 6 costs 270 points, from which you get 18 strength 4 attacks and 3 stomps which makes it effective. They are still very hard to kill and that is where their strength lies. Being hard to kill is a rare skill in the Wood Elf army when surrounded by toughness 3 armour-phobic elves. This makes the Treekin the ideal candidate for an anvil unit. 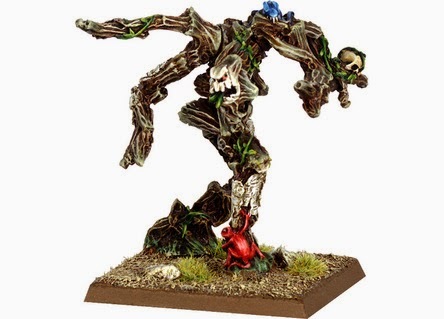 If you see a unit that you don’t want to fight right now then simply move the Treekin (or walk them between worlds) in front of the unit and feel secure that the unit will be held up for at least 2 rounds of combat (depending on break tests and if the other unit is magically buffed). I feel the backlash against Treekin came about due to the loose of offensive power, but the Treekin’s worth isn’t measure by how many models it can kill but by how much time it can give you in holding back the enemy unit you don’t want to face. I still believe they are a good unit and be willing debate anyone who says otherwise. The Wardancers are a unit that went from being meh in the old book to becoming a viable unit in the new book. 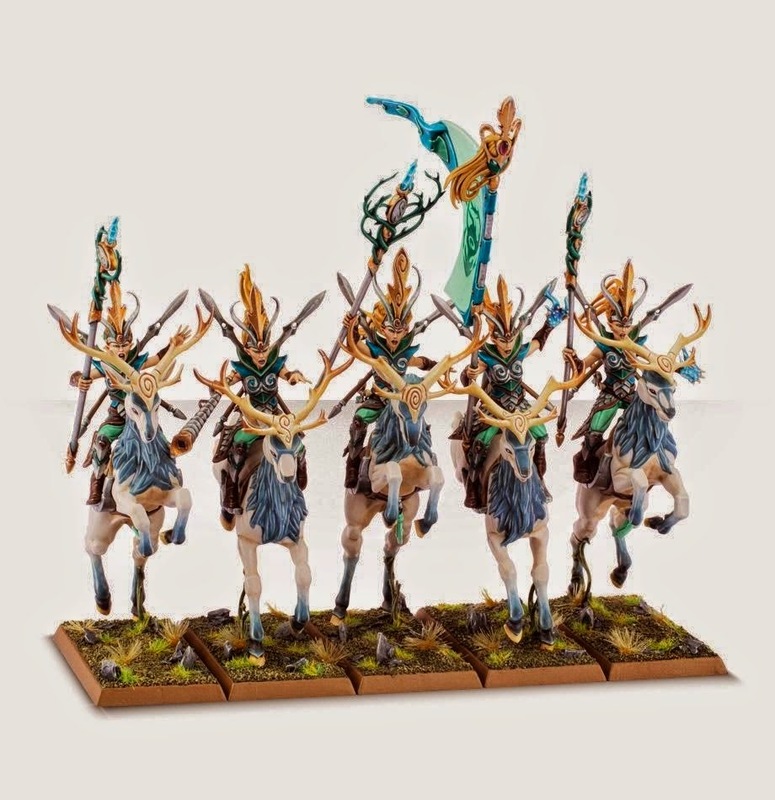 For a mere 160 points you can get a unit of 10 with a champion that can fill a role that very few other units can in the Wood Elf army (expectations being Treekin and Treemen). What is this role you ask? Well let me explain…..
Role: Charge Absorbers, Character Killers, Chaff Hunters. The Wardancers are unique in that they are the prefect unit to absorb things like impact hits and charge bonuses. They can do this because of the 3+ ward save dance that you can pick Before impact hits are resolved. Say that there is a unit of angry goblin/chaos/dark elf/high elf etc chariots looking to make a flank charge on a valuable unit, or just looking hungrily at your lines. Place the Dancers in in such a way that the unit will charge, or must charge them, receive the charge, absorb the charge with the 3+ ward save dance then beat the unit with either the +1 attack dance or killing blow dance. But that’s not the only role they fill as they can also mince chaff with the +1 attack dance (this means that a unit of 10 can pump out 21 ASF initiative 6 weapons skill 6 strength 3 attacks), and kill characters and single wound high armour save units with the killing blow dancer. However keep in mind that their defense is their offense and as such will die quickly and are likely to do poorly in prolonged combats. With that being said I now consider these guys an auto include in my army. After realizing that perhaps Doomfire Warlocks were a teensy bit too over powered the GW Design Team came up with the Sisters of the Thorn (or as I refer to them as the “We’re sorry about the Warlocks” unit). As such the Sisters can pull off similar things to the Warlocks they just can’t do them as well. They also run into an issue I foresaw with the Warlocks, that being that they would compete for the sparse magic dice. If you build your lists like I do (starting off with a Level 4 mage) then you have pretty much removed the Sister’s casting role. Chances are that your level 4 will need all the dice he/she can get and the Sisters will miss out. They miss out even more in my list because I also have a level 2 mage, so the Sisters get no power dice (unless I roll really, really well). With the casting role removed what does that leave for the Sisters to do? Well if you give them a standard and the Lichborn pendant them they get a 3+ ward save against magic missiles and direct damage spells, and if your mounted wizard also has the Talisman of preservation he/she too can get the 3+ and so the Sisters become a decent wizard bunker. They can also act as Elite Chaff, I say Elite because most people expect their chaff to simply die and hold up the enemy, whereas the Sisters actually have a chance of doing some damage back to the unit that charged them. Regardless you won’t need more than 5 to fill the role you have planned for them. Like an angry, pissed off meteorite these guys are the Glass Hammer of your army. They used to be meh and now they the unit your opponents should dread (and try and kill very quickly). Regardless of what your army’s overall play style is you should have a unit of these guys in your army. Why? Because they can take care of the unit the rest of your army can't handle. Role: Meteorite unit, Bus Slayer. So why are these guys so good? Well a unit of ten can pump out, on the charge, 21 strength 5 armour piercing, ASF, Initiative 5 attacks and the steeds can pump out 10 strength 4 attack (because they are frenzied). This can destroy most units (with the exception of Skullcrushers and Demigryphs, although I am fairly certain a unit of 10 Wild Riders would give them a run for their money). The weakness of the Wild Riders is the weakness of all Wood Elves, toughness 3 with a 4+ armour save and a 6+ ward save. So they will die, quickly, that’s why I call them a Meteorite unit because while they do horrible things to units, they will die quickly to return attacks and even zombies could do some damage to these guys. The best way to use them is point them at a unit you don’t like, destroy said unit and then either rinse and repeat if the unit still has 5 or more riders, or if the unit is below 5 riders run them away and conserve points. 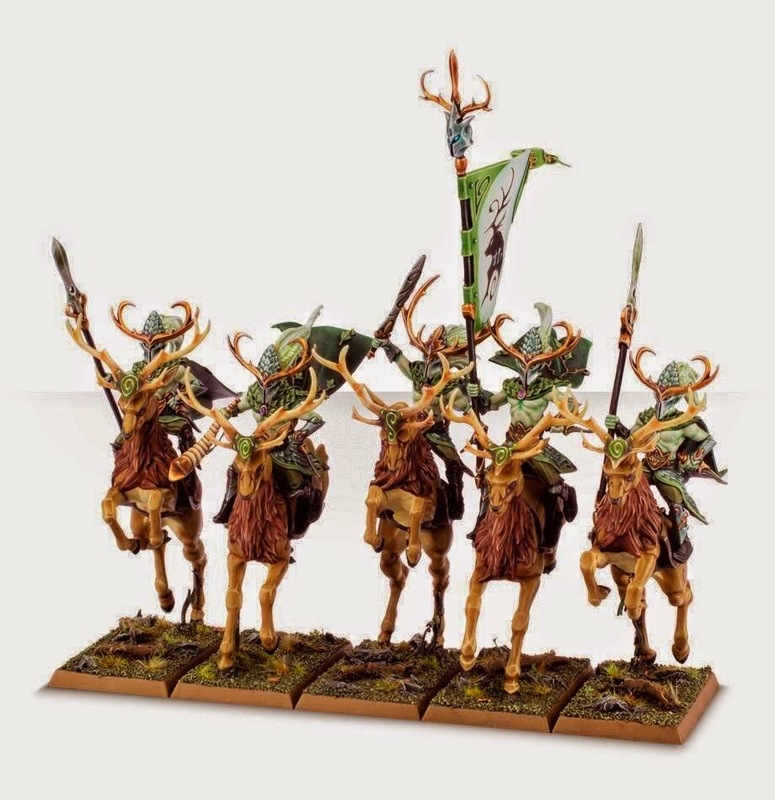 Some of you may be wondering why I have the Treekin, Wardancers and Wild Rider unit sizes at the size I do. And you have good reason to wonder. Simply put the reason why I recommend all those units have at least 2 ranks is because that way they can lose a ranks worth of models and still fulfill their role. If my unit of 10 wardancers loses 4 models then the combat effectiveness of the unit is only reduced by 4 attacks essentially giving the unit a buffer of 5 models before it starts to loose combat effectiveness and the same reasoning goes with the unit size for Wild Riders. Treekin are slightly different, the reason why I recommend 6 is that 6 Treekin only cost 270 points which isn’t that much, any more Treekin would push the unit into the 300 point range which would make them too expense for a unit that has a decent chance of being removed, as its role demands that the unit is placed in harms why. I just thought it would be a good idea to explain my reasoning for the unit recommended unit size. Well that’s all for now. The next post in the series will focus on rare units, mainly Waywatchers and Treemen. Finally I didn’t write anything about Wildwood Rangers and Warhawk Riders, this is because I have yet to use them and so I would only be speculating as to their role, and just like the Enchanted Arrow tactica I will redo this one in a few months time and should hopefully be able to talk about those units then. Until next time. I think that you need a have a Battle Report with some of these guys! I was seriously considering Wood Elves when I got into WHFB but went with Dwarves (and then Empire) instead. Its nice to finally see GW send them some love and give them some nice models. I completely dig the new Wild Rider kit. 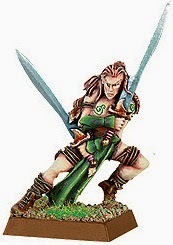 Yeah i do want to publish a battle report with the new wood elves, i am going to aim to get one done this weekend. Also the 10 wardancers will be able to pump out 3 attacks each with the +1 attack dance, because of additional hand weapon.